High rigidity direct drive. Close circuit system corresponding superior precision control with smoothness high efficient operation. Ironless type linear motor, smooth and stable during low speed movement. Without conventional transmission structure, gear gap do not exist in linear motor. No more dirt accumulated between gear gaps. Without ball screws no more lubrication grease need to be apply, perfect for clean room environment. 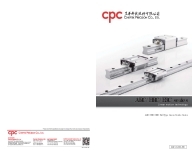 The cpc ARC/HRC/ERC Linear Guide Series uses the O-type arrangement for the four row ball circulation design. The contact angle between the rail and ball is 45 degrees, and can realize the 4 directional load effects. cpc places special emphasis on strengthening the Arm length(LO), so when sustaining external force F, will have even higher Mr value to increase the rigidity and static moment capability. For more information send an inquiry directly to Chieftek Precision USA Company Ltd. CONTACT CHIEFTEK PRECISION USA COMPANY LTD.